Peer-to-peer lending (P2P) is one of the most popular ways to both borrow and invest money. Two online P2P companies leading the charge in this revolution are LendingClub and Prosper. In 2005, Prosper was the first U.S. peer-to-peer (P2P) lender. LendingClub made its debut a couple of years later. Both companies offer borrowing and investing opportunities to anyone with good credit, but Prosper has slightly looser eligibility criteria. But which offers better value to borrowers and investors? 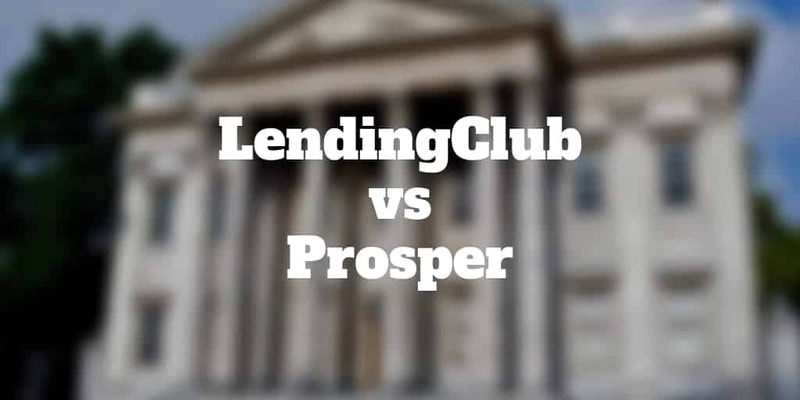 We compare Prosper Vs Lending Club across all their key factors below. For Investors: Which Is Better? Most borrowers don’t realize how much money big financial institutions make on each loan. Interest rate spreads are often high, which is why banks can pocket billions of dollars each year in profits. P2P marketplaces offer a great opportunity to cut out middlemen and may even offer you a better deal so you get to keep more money in your pocket. The way P2P works is that borrowers submit loan requests and investors finance those loans. Generally, investors will spread their risk across many borrowers and borrowers loans’ are often funded by many different investors. When a sufficient number of investors commit funds to meet a borrower’s financing needs, the loan gets funded and cash is deposited into his or her checking account. Investors then reap the interest rewards as the borrower pays back the loan with interest. Borrowers can often secure funding faster and cheaper than might be available through traditional banking institutions. When you take out a loan with LendingClub or Prosper, you will be charged an origination fee. Investing with LendingClub or Prosper also comes with a service fee. Each company charges a 1% service fee that’s due upon payout of funds to the borrower. Prosper is a pioneer of P2P online marketplaces. With a long history of meeting the needs of borrowers and investors, Prosper caters to a broad customer base – even those with so-so credit profiles. Loan Amounts With Prosper, borrowers can access loan amounts that vary between $2,000 and $35,000. Eligibility Criteria Prosper performs a soft check on your credit, which must score 640 or higher. The application is basic and includes employment information and income data. Your interest rate is ultimately determined by these factors. Repayment Timeline You have between 3 and 5 years to pay back the loan. With interest rates that can soar upward of 30%, the short payback period is a good thing to cut down on interest charges if you can afford the regular repayments. Speed of Funding Once a loan is approved, the funds will be placed into your bank account in about 1 to 3 days. The loan approval process takes approximately 7 business days. Although Prosper has a straightforward website and user experience, LendingClub is even simpler to use. If you’re a new borrower, the simple online application process is a huge plus. You’ll also find more loan options at LendingClub than you will at Prosper. For example, it’s possible to refinance an auto loan and pay off credit card debt with two loans from LendingClub. Loan Amounts LendingClub has loans ranging from $1,000 to $40,000. Eligibility Criteria LendingClub requires a minimum credit score of 660, which is slightly higher than Prosper’s minimum credit threshold. However, the tighter eligibility criteria result in lower interest rates for those with good → excellent credit. Repayment Timeline Like Prosper, LendingClub requires that borrowers pay their loans back in 3 → 5 years. Speed of Funding LendingClub advertises a 7 day turnaround from when the application is received and funds are deposited into a checking account. This time frame can vary from person to person. Because LendingClub and Prosper are the main online P2P lenders in the industry, their differences are subtle. Your financial standing will be a big part in deciding which lender is right for your needs. ✅ Lower Rates: Although only by a whisker, LendingClub offers lower rates. Its strict credit score requirement permits it to lend at more favorable rates. ✅ Looser Qualification Criteria: Prosper offers more wiggle room when it comes to credit scores. Other qualification criteria, such as income stability, are virtually the same with LendingClub. ✅ Faster Processing Timelines: LendingClub offers a 7-day turnaround, though it doesn’t guarantee that timeline; underwriting and paperwork delays can extend it. ✅ Origination Fees: Prosper origination fees are lower and help to balance out the small difference between its rates and those offered by LendingClub. ✅ Easier User Experience: LendingClub has the simpler interface, which is helpful if you’re new to P2P lending. Get familiar with the process at LendingClub, and then you can try out Prosper’s site in order to experience the difference for yourself. ✅ Relaxed Repayment Terms: Both lenders require full payment by the end of 3 → 5 years. Extending the loans for longer terms isn’t possible with either company. ✅ Large Loan Amounts: With lending options maxing out at $40,000, LendingClub offers larger loan amounts. For borrowers who want smaller amounts, Prosper offers loans starting at $2,000. ✅ Smaller Loan Amounts: LendingClub allows you to borrow as little as $1,000. LendingClub and Prosper have the exact same requirements for anyone looking to invest in their loans. However, there are a few differences in investments once you pass the lenders’ basic criteria. For investors who wish to take charge of their own investment decisions, Prosper offers loan breakdowns and credit data in order to help you make educated decisions. You can buy a piece of a loan or the entire thing in the Prosper marketplace. Historically, average returns at Prosper range from 4.9% to 9.9%. With bank interest rates on savings accounts still at long-time lows, Prosper interest rates are an attractive alternative. While Prosper has an automated investing solution, LendingClub has the simpler interface. You can choose to invest in low-, medium-, or high-risk loans. LendingClub software performs the calculations and assesses investments on your behalf. The entire process is done with just a few clicks of your mouse. Historically, LendingClub boasts returns that range from 5% → 7%. These amounts are lower than Prosper’s rates, but it also has a better track record with fewer loan defaults. The strict criteria that need to be met in order to issue loans may be the reason why. Higher returns often follow high-risk investments that aren’t necessarily part of LendingClub’s platform. Before selecting LendingClub or Prosper, consider the following criteria to make a more informed decision. LendingClub has been around for more than a decade, and that longevity shows with an easy site navigation. When you use LendingClub, you’ll be able to view all of your loans or investments on one page. You can modify the numbers easily to see which investments might be a good fit. By contrast, the user experience on the Prosper website is not as intuitive. Borrowing and investing requires more familiarity with the website. Borrowers with lower credit scores are eligible to apply. Prosper has some cool features for its customers. For example, you can use a “Prosperity” plugin in Google Chrome that allows you to auto-fill credit data on your loan page. Each loan has a credit history attached to it, which helps you diversify your portfolio. With the credit information, you can invest whatever you’d like into the loans. Whether you want to invest $29 or $1,029 into a loan, it’s up to you. In contrast, LendingClub requires investments in $25 increments. LendingClub boasts a huge assortment of loan choices, including business loans, auto refinancing, and debt consolidation. Even home purchases and vacations are options. Prosper focuses on unsecured debt that’s typically credit card-based. Borrowers with loftier goals may want to stick with LendingClub’s numerous options. Both lenders have taken cues from each other over the past decade or so. In many ways, they’re very similar so you may wish to check rates at both to find the best one to meet your needs. For borrowers, a low interest rate is key, which is where LendingClub usually shines brightest. For investors, the freedom to pick and choose how much they commit and to which loans may be the top priority, which is where Prosper has the edge.